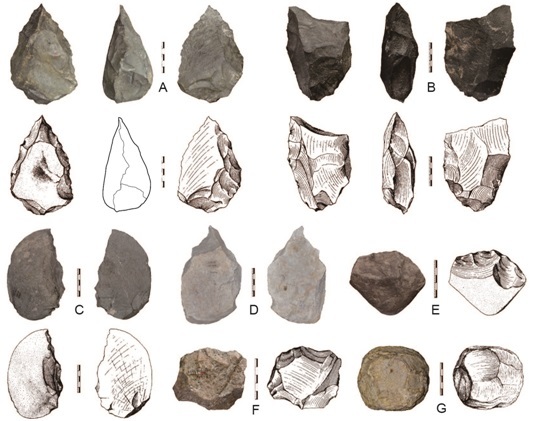 Acheulian technology is characterized by bifacially and unifacially shaped tool types, such as handaxes, cleavers, picks and other large cutting tools. Its appearance represents a technological advance over the preceding Oldowan technology, and is associated with innovative hominincognitive and adaptive abilities. While most of the Early Pleistocene sites that contained Acheulian artifacts were found in Africa and Europe, rare Acheulian artifactswere found in East Asia. In 1960s, Prof. HUANG Weiwen of the Institute of Vertebrate Paleontology and Paleoanthropology, Chinese Academy of Sciences, found more than 100 stone artifacts from Huixing town in Sanmenxia city. Some of them were lateridentified to be typical Acheulian artifacts, including handaxe, cleaver and pick (Fig. 1). Therefore, unraveling occurrence age of the Acheulian artifacts from Sanmenxia constitutes a key aspect of understanding the archeology and dispersal of Acheulian population in East Asia. Professor AO Hong from the Institute of Earth Environment, Chinese Academy of Sciences, and his colleagues, present a magneto-cyclochronology for the Acheulian assemblage from Sanmenxia Basin. The studied section is 103 m thick and is composed of two lithological parts: the upper loess–paleosol sequence(0~83 m) and the lower fluvial sediments(83~103 m). 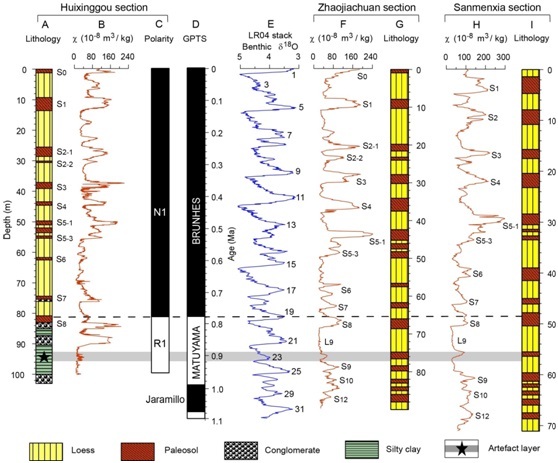 The artifact layer of the site occurs at 92~95 m. Magnetic susceptibility analysis and stratigraphic correlations suggest that the upper loess-paleosol sequence ranges continuously from S0 to S8 with no sedimentary hiatus (Fig. 2). Paleomagnetic results indicate that the section records the Brunhes and upper Matuyama chrons. The artifact layer occurs in the fluvial sediments at 92~95 m, ~8 m below the Matuyama–Brunhes boundary. It has an age of ~0.9 Ma and corresponds to the relatively subdued interglacial MIS 23. Therefore, Acheulian artifacts from Sanmenxia are slightly older than the Bose Acheulian stone tools, which are considered the oldest in South China and are dated at ~0.8 Ma. This study distinctly enlarges the geographic distribution of Acheulian technology and brings its occurrence in North China back into the Early Pleistocene, which is contemporaneous with its first emergence in Europe. Combined with other archeological records, the larger area over which Acheulian technology existed in East Asia during the terminal Early Pleistocene has important implications for understanding early human occupation of North China. This study was published in Quaternary Science Reviews (Li X W et al., 2017. Early Pleistocene occurrence of Acheulian technology in North China. Quaternary Science Reviews, 156: 12–22).